Even if I’d been to Woodenbong BEFORE I listed the Aussie place names that WON’T keep you guessing, it never would have made the cut. Yes, there really IS a town called Woodenbong. And no, this Northern New South Wales town just south of the Queensland border and ~150 km west of coastal hot spot Byron Bay ISN’T named after a giant wooden bong. Nor did I find anything else in its surrounds to which its unusual name could be attributed. But I DID find a small town worthy of a TOP Aussie Towns title! Here’s FIVE good reasons why! But the scenery doesn’t end at the township. 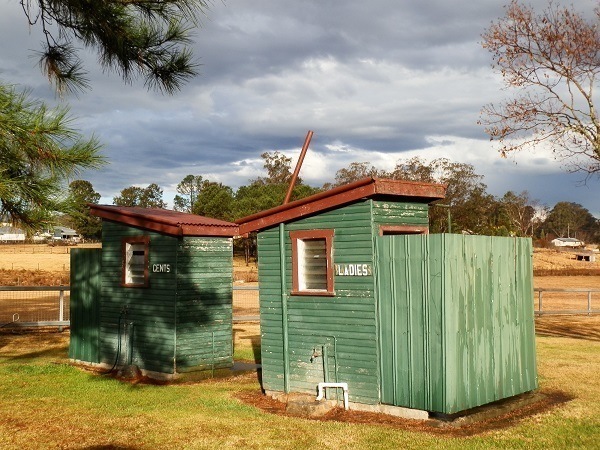 A mere $10 (+ $1 for a hot shower) per night will get you a powered site in the community camping area at the sports oval making Woodenbong an ideal base from which to explore the Upper Clarence region, of which this is a part. And who knows? You might be as lucky as we were and get to be there for the school sports day! It’s SO not a tragedy that Woodenbong doesn’t have a bakery when the pizzas from the Woodenbong Hotel (can’t miss it, there’s only one) are THIS good. Oh, so you want a photo?? It’s not going to happen – who thinks about taking photos with a FINE pizza in front of them? The Pub’s worth a visit in it’s own right. It’s a beauty inside and out, with friendly and welcoming staff, open fires, a lounge room with books and magazines, and an excellent menu. But who am I kidding? If you ever find yourself at the Woodenbong Hotel, you’ll also be right in the hub of the pizza universe so just do yourself a favour and order the pizza! What was once the Lindesay Highway stretches from Beaudesert up north in Queensland, through Woodenbong, then southwest to Tenterfield. Until it reaches Woodenbong, it’s a pretty good road. From there, it’s a disgraceful collection of potholes, ragged edges, steep drops, rocks, blind corners, narrow passes and undulating surfaces. So why have I listed it as one of Woodenbong’s attractions? It’s the route to some of the most scenic spots in the region! AND an adventure – if you treat it with the respect it deserves! Just down the road and round the corner on a scenic drive from Woodenbong, Tooloom Falls, complete with picnic area, loos and campground is a great starting point. 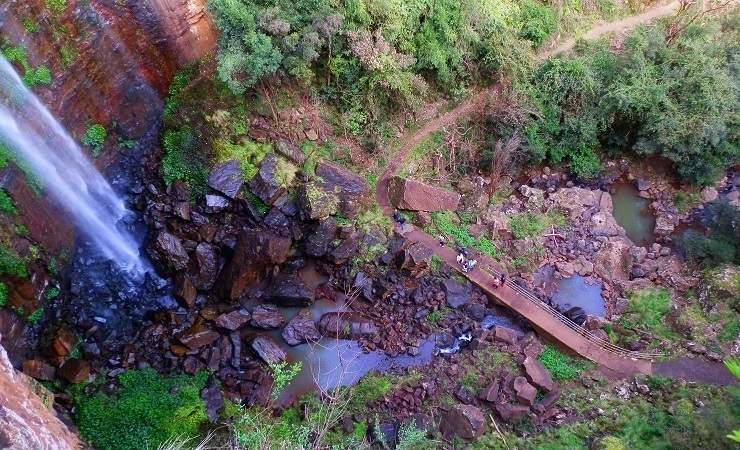 The 8 metre drop means the cows drinking at the pool below the falls have NO chance of making it upstream! According to one tourist brochure, the name is derived from an Aboriginal word ‘Dooloomi’ – or headlice – so named to deter youngsters from swimming in the dangerous pool! A little further on is lovely Tooloom National Park with its loop trail through the World Heritage listed Tooloom Scrub and a lookout with magnificent views across the Koreelah Valley. A detour off the scenic drive and remote Koreelah National Park brings you face to face with Australia’s Gondwana Rainforest – and Koreelah Falls. Drive south through the magnificent flooded gums of the Yabbra State Forest lining the Bonalbo road to another scenic gem – the Bean Creek Falls (see above), part of a network of creeks at the headwaters of the Clarence River. A shortish drive across the border into Queensland past Mt Lindesay, and the distinctive peaks of World Heritage listed Mt Barney National Park rise against the skyline. Several shorter hikes make this wilderness area accessible, with longer treks recommended for experienced bushwalkers only. If you’ve had the guts to travel the Mt Lindesay Road, then Queen Mary Falls just over the border with Queensland is a fitting reward – or at least a handy rejuvenation point for the death-defying drive back to Woodenbong! Part of the Border Ranges National Park, there are several falls along the road to Carrs Lookout, a spectacular view across the Condamine Valley. These aren’t the main public amenities in Woodenbong. They’re not even the main conveniences at the sports oval and camping area! But, they’re the most scenic! Especially when set off by an unseasonal black stormy sky erupting into a wild storm and lashing rain, finishing off the school sports day and driving us inside the camper trailer for a fiercely competitive bout of word games until it was over! Post-rain sunsets really ARE the best! And the name? It’s from an Aboriginal word meaning ‘ducks on water’! « How I turned my TRAVEL habit into a BOOK! I feel you have very positive feed backs.and.yes … .visitors really have to ask a local of the best places to see in this peaceful country side. Accept the way of living in this beautiful community you will love it. Thanks again, Nancy! The visitor centre is one of the best places to find information – especially when there’s a local there to guide you! What amazing pictures they are. Truly magnificent. Thank you for your post. It was a delightful surprise coming across this article regarding our Hotel and Woodenbong! We truly appreciate you taking the time to enjoy both our little hotel and the place where we live in our small corner of the Northern Rivers. So, ‘hub of the Aussie Pizza universe’…That really put a smile on our faces!! At the end of the day when people take the punt to try us out for the first time or if it’s the hundredth, it is something special when they take the time to notice and appreciate what we are trying to achieve. In fact, we would love to meet more new faces that come out to try our pizzas!! Our pizzas are made fresh each time someone orders one, and the dough and sauce are special house-made recipes. Passed through Woodenbong last week, it is a great little town although coffee on a gravel floor didn’t appeal to us. The pub was great and friendly staff, the pizza and the Indian would be the best we have tried in a long time anywhere… To sit at a table outside in a grassed area just added to the experience. Hi Bystander! It’s my pleasure to pass on the tips! Glad I’m not the only one to appreciate the delights of Woodenbong – especially the pizza! The night we went it was COLD, so no sitting outside for us! We didn’t explore Urbenville at all – just drove through a couple of times going to the other spots, so can’t comment. I’ll have to check it out for myself next time I’m in the area!! You’re right, Lynda, and thank you! With all that travelling around we didn’t get to do absolutely everything in Woodenbong itself! We’re saving that for our return visit – if you like, put in another comment with the names of the Cafe & B&B for future reference! Looked at buying a corner block in town in the 70’s. Was really cheap. think it was around 1,500. Decided against it as it was too far from anywhere else and we were from Sydney. Is there a shopping center there now or just a pub and corner store. There was a pub, small IGA and corner store, and a few other shops when we visited, Ros. Kyogle isn’t far away with a much bigger centre either. It’d still be a culture shock after Sydney, though!!! I am disapointed you didn’t mention Urbenville on your travellogue, you have to drive through it to get to Tooloom Falls. We have a great pub too, and the Pizza’s are even better at the Crown Hotel. Great steaks and fresh veges and salads grown locally. Check out our own mountain Couttes Crown Mountain. We also have an historical museum and settlers cottage which is an original one built in the 1800’s The pub was built in 1910 after the original one burnt down. And there’s my house, built in 1912 The bank and managers residence. the bank still has the original vault safe in it. My verandah is the best place to sit and watch the world go by with a beer and or a bottle of wine. The pub runs regular dirt bike rides at the weekends with accommodation and meals included in the cost. Lots to see and do in and around Urbenville.! Lindy – I couldn’t have done Urbenville justice as we only drove through on this trip. One of the tragedies of travel is all the places you don’t have time to explore properly and have to leave for another time. I know there’s also a great campsite (we saw that as we drove through) and you’ve given me (and many others) some good reasons to check it out! Just see how many people turn up on your verandah now! Thanks for your comment, it’s much appreciated! Thank you Lindy, yes Urbenville has a lot to offer which is on one of the Head Waters of the Clarence River. Urbenville has an accredited Information Visitor Centre endorsed by the Tenterfield Shire Council. It has lots of information knowledge on our local area. Thank you Nancy! I know we’ll spend longer in Urbenville on our next visit! I’d love to see Bean Creek Falls with more water, Colleen – if you want to share your pic, just like my Facebook Page (Redzaustralia – see link on right sidebar) and share it there! I thought it was pretty good when I visited, but always happy to see it looking different!! Great post Red, you’ve made me want to explore more of this area. I was at Dooloomi, or Tooloom Falls just a couple of months back and passed through Woodenbong. Sounds like so much more to explore here. Great pics and sounds like a great place for a poo too. Thank you Andy! I LOVED the whole area – of course, anywhere can be a base for exploration depending on how far afield you want to go. But the only reason we left Woodenbong after 4 nights was to do our washing!! PS Check out my book “Aussie Loos with Views” and you’ll never be wondering where to have that dump again!!! Woodenbong is just one of the amazing small villages and towns that are part of Kyogle Council’s LGA. Urbenville, Old Bonalbo, Bonalbo, Tabulam, Drake, Mallanganee, Mummulgum are all unique and we live in the heart of the Upper Clarence Valley. The Clarence River winds it’s way through spectacular countryside, a birdwatcher’s paradise, ( the feathered variety), camping, canoeing or just enjoy the small cafe’s, community events – Tabulam’s premier event The Tabulam Races is on Saturday 8th November. (Check their FB page for details. ) Clarence River Wilderness Lodge, Clarence River Canoes are two examples of helping you re-wild yourself. The wide open spaces, fresh air, friendly locals will welcome you……take the road less travelled and do yourself a favour! Couldn’t agree more, Jeanette!! Our first stay in this amazing region this year – over a week at Kyogle, and a few days at Woodenbong – certainly won’t be the last! I’ve already featured Mallanganee on my blog too – although it’s just the scenic public loo at the lookout above town! Keep watching – there are MORE blog posts about the Kyogle LGA to come!! Loved it!! Well I had never heard to Woodenbong…..but it looks like I will be putting it on my list of places to visit when I get over to that neck of the woods. I actually don’t know anyone else who’s been to Woodenbong!! But I hope this opens up the stampede – the region really IS magnificent!! Thanks for a new post again in this week! Aussie waterfalls are high, scary… and beautiful. I remember some. Thank you Kozue! Some of the waterfalls in this region aren’t so big – but there’s always danger! I don’t like heights so standing at the top is VERY scary no matter how high it is!! Haha, the name Woodenbong did conjure up a picture of a few hippies sitting around smoking weed out of a wooden bong! And that would not surprise for that particular area just over the NSW border from Qld. Now you have really got me intrigued and I have to add Woondenbong to the places I would like to ‘Sunday drive’ to. What spectacular scenery. Kathy, I kept forgetting how relatively close it was to the coast! It’s a different world!! Check out the Woodenbong website (link in the post) and visit on a Yowie Market day – we missed that, but it sounded really good!! I’ll look forward to seeing it on YOUR blog!! I was wondering when you’d pop up again on your travels! Pizza, huh? Now I am hungry! Ok never heard of Woodenbong but hell it does look like a nice town and I do like a nice pizza……………. you find the most amazing places with gorgeous scenery. It’s amazing that the more we look, the more we find! Who knew Woodenbong even existed?? Let alone that it’s the hub of the Aussie Pizza universe?! Glad you like it – and look out for more!